A month into my study of black women cooking in America’s kitchens and already I can see numerous professional characteristics displayed by slave women. Plantation cooks worked under pressure and still devoted attention to detail. Fashioned a creative style under stone-age conditions from meager ingredients. Possessed exceptional organizational skills. But, it was their forebearing management style that caught my attention this week, following popular British chef Jaime Oliver’s TED challenge that Americans take back responsibility for educating their children about food. If Oliver’s plans to join the Obamas and others in the fight against obesity and food ignorance seems intrusive, it shouldn’t; we live in an era when many adults become completely depressed by the thought of kids in the kitchen. Not these women. They supervised a gaggle of helpers, some of them young children, without surrendering their hearts to despair just because of the distraction and hazard of children underfoot. We all know that slavery’s children were exposed to heavy labor at an early age. From Works Progress Administration interviews, we also learn about the skills and traditions their mothers handed down to them as they worked side by side, which reveals a communal spirit, not weakness. Imagine Mammy or Aunt Chloe redirecting her feelings, telling herself and her children they were allowed “to “play” in her kitchen or to “help out” with the cooking. At the same time, in an informal way, she taught them basic responsibilities, transferred culinary expertise, and instilled confidence and self-esteem, when she allowed the child to accomplish simple tasks like helping her to put on a pot of rice. I have to admit that some nights, these narratives troubled my sleep, but most times, I tried to put on my own mother apron and think about the joy I share with my children at the table. And that brought memories of my son Brandon’s Chocolate Chip Cookies to mind. His recipe is a family favorite that grew out of a challenge when he was in middle school and I was a newspaper food editor. He taunted me into a weekend cookie bake-off, which he proceeded to win with this simple, sweet recipe. I make them with the kids in my cooking classes and we still laugh about it today. What recipe did your mother use to bring you into the kitchen? Preheat oven to 350 degrees. In a large bowl, stir together margarine and shortening until mixed and light yellow. Add sugars and stir until creamy. Stir in vanilla and egg. Stir in flour, soda and salt. Blend well. Stir in chocolate chips and mix well. Wrap in plastic and shape into a 12-inch log. Refrigerate until firm. Slice cookies about ¼-inch thick or drop dough by rounded teaspoonfuls, 2 inches apart onto a lightly greased cookie sheet (or spray with non-stick vegetable spray). Bake for 8 to 10 minutes or until light golden brown. 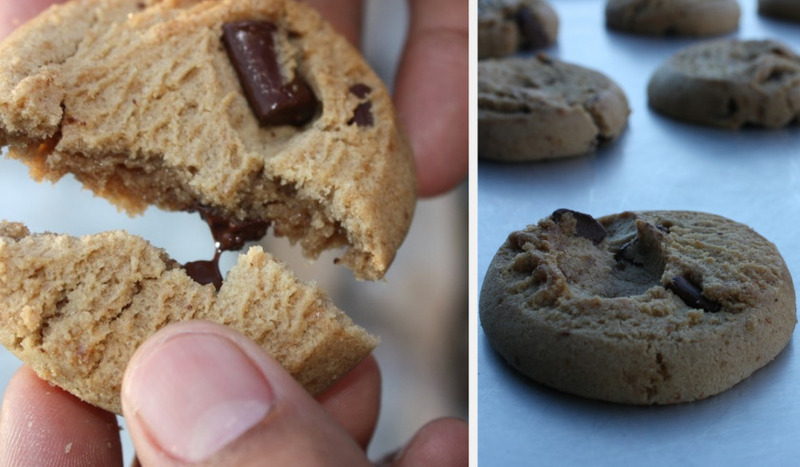 Immediately remove cookies from cookie sheet to wire racks and cool. My mom got me in the kitchen when I realized that we could always have desserts on hand if I baked them. Suddenly I made it my personal mission that there was always a cake or cookies at the end of the meal. I started out with lots of boxed cakes and packaged brownies, but she taught me some basic cookies and lemon bars that I still love to eat today. So true. And, have you ever noticed how much more lively and engaging the conversation is at the table over really delicious food? My kids seem to open up and chat when they don’t feel like they are in an interrogation. We definitely need more time together at the table and less time in the pantry opening packages to learn about their friends and their lives. Me too. Nothing wrong with fresh ingredients made into something special. The problem is we eat a ton of ordinary packaged desserts instead of savoring something truly delicious as a treat. I heard a woman on the morning news say there’s nothing wrong with birthday cake and ice cream, but we are acting like it’s someone’s birthday everyday.